Like any thoughtful Significant Other would, Dan brings me gifts regularly. But unlike the usual bouquet of flowers or similar traditional items that most women probably get, my gifts are from nature, and perhaps the more thoughtful for it. I’ve had a little collection of such items on the shelf in my study, and when Dan brought me another the other day I decided I’d put them all together for a blog post. The Blue Jay feathers have been on my shelf for a little while. I didn’t actually ask where specifically he picked these up from, but a jay was partially de-feathered along the trail back in our fields a few months ago, so perhaps it was from there. Blue Jay feathers are so pretty, such a surreal cerulean blue, a shade not well-captured in photos on a monitor. He just gave me the two feathers, shown here; can you tell from which part of the bird they came? The one on the left is a tail feather, while the one on the right, the one with the white tip, is a wing feather. The easiest way to determine this is by the placement of the feather shaft. On the tail feather it’s almost directly down the center of the feather, while on the wing feather, it’s offset slightly to one side. This offsetting actually tells you from which wing it came from, too; the shaft is closer to the outside of the wing than the inside. So this is a feather from the left wing. Blue Jays only have white on the tips of their secondaries, not the primaries, so we can narrow it down even further to a secondary on the left wing of a Blue Jay. Most passerines have 9 primaries and 9 secondaries, three of the latter group being shortened and modified to form the tertials, leaving only six full-length secondaries. We can tell within six feathers where this one came from on the bird. The beetle bits are pretty neat. Dan found the single elytra, on the left, first and brought it back for me. I knew what it was from the size and pattern: it’s from a Giant Water Beetle, one of which I’d found at about this time last year. A few days later he found another, this one nearly intact except for missing its abdomen. Even the legs were still there, curled underneath. The interesting thing about the second, nearly whole one is the obvious puncture in the middle of the back. Was that made by a sharp bird beak? Or by the canine of a hungry raccoon? I asked Dan’s opinion, and he thinks it’s definitely a bird predation; I’m inclined to agree. We mused over what would be small enough to make a hole that size, that would be feeding along the water’s edge; his suggestion was grackle. All of the blackbirds have narrow, pointy beaks that would fit that size, and would forage at the edge of the pond, so this seems like as good a guess as any to me. And the third item he brought to me Raven actually found. It was an egg that she’d picked up from under the cedar bushes near our house. Dan retrieved it before she’d damaged it too much; we’re not sure if she’d found it on the ground or where it came from, but couldn’t see a nest in the cedars. 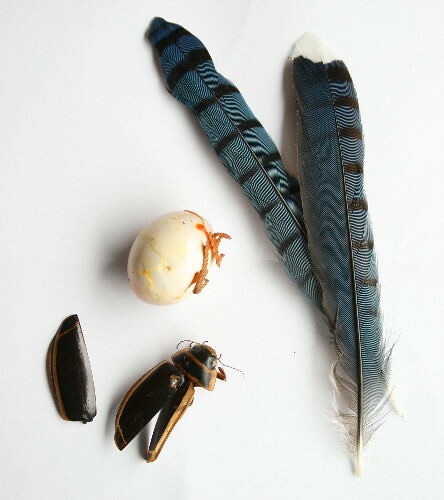 Dan’s guess is that it was from a Mourning Dove, which seems about right in terms of size and colour. He suggested I open it up to see if anything was inside. So I did. And there was. At first it looked like it was just a lumpy blob of yolk, but then I noticed a darker bit at one side, partly concealed. 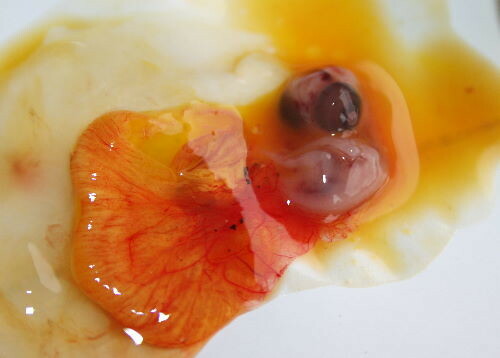 Finding a twig to use, I gently cleared away the yolk sac to expose the dark area. 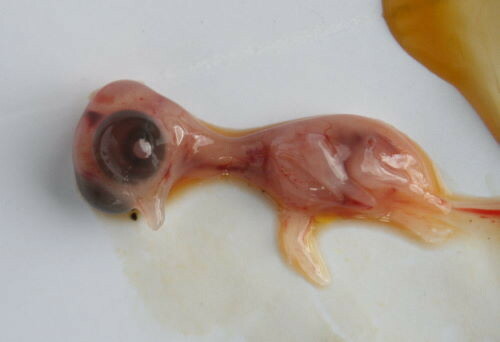 It turned out to be an embryo, still small, only about a centimeter (< 1/2″) long. The dark spots are its eyes, and its body curls beneath its head. Look at the network of arteries that has developed, running through the yolk to absorb the nourishment the chick needs to grow; the bird’s equivalent of our mammalian umbilical. I stretched it out away from the yolk for a better look. Check out the tiny, translucent beak, the developing wings. You can see the rudimentary thumb on the wing, near the bend. Notice the pale spot in the eye. Birds have a ring of bone inside their eyeball, inherited from their reptilian ancestors, called the sclerotic ring. It serves to strengthen the eye and is often found in animals that lack spherical eyeballs. The pale spot is the hole in the center of the sclerotic ring. Mourning Doves have an incubation period of about 14 days. Diagrams on this page (which is for chickens and therefore an incubation period of about 21 days) suggests the embryo is about halfway through its development; perhaps 7 days old for this Mourning Dove chick. 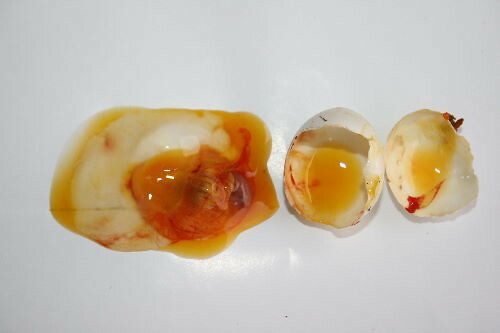 Check out this list of developmental events in the growth of a chicken embryo (taken from that same page). Look at how fast those first stages happen! And now think of it sped up by a third again for a Mourning Dove chick. Pretty amazing. Congratulations on your new book! I came across your blog somehow through blogspot, and I am very impressed! My best friend’s daughter in UK is an ornithologist and able to make a living from it there. I took the easy way out and although interested in birds became a doctor. There was never any shortage of patients. It seems you have tendencies in that direction, maybe a pathologist next? thank you for sharing your treasures in this post. they, and the writing, are truly amazing. Wow. thank you so much for sharing all of this information– I was fascinated and impressed!